Anita at A Wife, A Woman, A Mom just gave me my first awards - TWO of 'em, no less! The Housewife Savant immediately followed with one of her own. Who knew it was award season? As I walk the red carpet to humbly accept my awards, you'll probably want to know that I'm wearing Threadless. People seem to want to know these things. I did my own hair. My jewelry was graciously provided by Swatch. After I bought it. Yep, the glamour and elegance that I live with every single day are heavy in the air tonight. I take my seat and anxiously watch other bloggers receive their awards and read their acceptance speeches through tears and nervous laughter. I am smug. I shall not succumb to any of that foolishness. I shall accept my awards with the humble nobility for which I am known. Ahem. Anita takes the stage. She looks lovely, as usual. We'll have to ask her who she's wearing. 1. Put the logo on your blog, nominate at least 10 blogs, which show great attitude and/or gratitude. 4. Share the love and link to this post, and/or to the person from whom you received your award. The lemonade award goes to: six people who aren't me, and, (drumroll please...) ME! Yay! I am so honored to be perceived as someone who has a great attitude and/or expresses gratitude. There are some in my direct line of fire who may disagree with this assessment, but they're not the ones handing out awards now, are they? I return to my seat to look over my shiny new award and try to figure out how to get it to display in my sidebar. I've no sooner figured it out (With a little help from my friends. Thanks again, Anita. And your daughters. And my husband.) than my name is called again. 3. 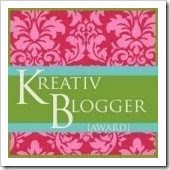 Choose 7 more bloggers to give the Kreativ Award to. First of all, 'creative' (or, 'kreativ', as the case may be) is one of the few compliments that I tend to manage to accept gracefully. It's a side I haven't shown TOO much of on this blog, opting instead to have a separate blog just for showing off my craftier side. It's relatively new, but I have a couple wips (works in progress) that I can't WAIT to show off! Okay, I totally cheated and only nominated three folks for each. 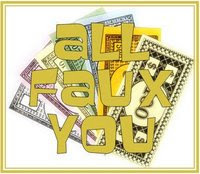 I am trying to steer clear of folks I regularly read who have just received the same or similar awards or requests. Your mission, should you chose to accept it, is to grab an award and post. It. Out. Don’t be afraid. Or do. Select at least 7 of your favorite bloggers and create the scenario of an outing. Host a luncheon, see a movie, or go to the park. Enjoy Ladies Night. You deserve to pretend that you’re going someplace. Treat everyone to a day at the spa, because you’re worth play money. Go to a play, or the opera. See a movie, meet for coffee, shop at the mall or a bookstore. The sky is the limit. Because we're all gonna go along with pretending you're that good. Write something unique that each of Chosen Few would contribute if you actually got met these peeps in real life. Or don’t, cuz real life is the scary part. Be sure to pick up the check. Your ersatz generosity will impress your imaginary friends. I think we can all agree that responding to that request will require a post all it's own. Stay tuned! I will be changing into an elegant pajama ensemble for the after-party, where, if you're really sweet to me, and maybe buy me a martini, I'll let you bask in the glow of my awards. Clink! (Our champagne glasses hit so hard that they crack and splatter bubbly on our fabulous ensembles and too-young escorts. Mine's my one-year-old cat. Yours?) I loved your acceptance speech. That was whip-smart. Thank you, though. Seriously. And congratulations, because you do write a damn good blog. Tammy, I knew you would have a terrific post to graciously accept your awards!!! What am I wearing, umm, worn out shabby but chic nightgown, a pair of socks and.......well coffee in hand, it's the morning after and it's 6:15 for goodness sakes! I'd like to say "Why, I'm wearing CATO, of course," but that'd be embarrassing left out there in the virtual world without a big HAHA after it, and THAT might be embarrassing (hurtful) to ladies who genuinely like Cato, which I do, sometimes. So I'm staying in jammies. I was working on my virtual party in my DREAMS last night... Hope to get it written before I head out of town today, but if I don't, it'll be up early next week. Oh, and Jenny? Who's gonna clean up that champagne and broken glass? Certainly not glamorous rock stars like us! Congrats my friend! I can say I knew you when!!! You look beautiful!!! And you were much more dignified than I was when I had my own awards night. You go girl! Congrats to you!! You are so deserving...your blog ROCKS! It has pretty much become a daily habit with me. Can you handle another award? There's one for you on my blog. It really must be award season. Phew! I'm exhausted from all of this. But, I'm not complaining. No siree!